Billed as a dark comedy, International Falls is, at once, a simple story about a middleage woman clawing her way out of a Midwest rut; but it is simultaneously a complicated, knotted ball of yarn about standup comedians, desperation, emotional fatigue and unsinkable optimism. It is funny, and in equal parts, sad and gloomy, just like the northern Minnesota town where it is set. Carrying this storyline is Dee, a mom of two, played by Rachel Harris. Dee is stuck in a dour life, working the front desk at a hotel and with a dolt of a husband, who is also cheating on her. The hotel happens to host touring, no-name stand-up comedians—and Dee happens to harbor a secret flame to be a comedian; two narratives that embark on a collision course when Dee strikes up a halfhearted affair with a down-and-nearly-out touring comedian. The bones of the film are strong, with a script that structures a layered narrative and also is punctured with stinging one-liners (like when Dee signs her divorce papers, the attorney flatly tells her, “welcome back to single life.”). It is Harris, who plays Dee, that brings life and soul to the script. She is casually magnetic. Her stage presence as a stand-up is gripping, to be expected from an actress who started with the LA-comedy troupe, the Groundlings (a group which has alumni like Will Ferrell and Phil Hartman), and her acting is deft, conquering equal parts from Fargo and from the title character of The Marvelous Miss Maisel. Originally a two-person play, the screenplay still holds some of the same stark intimacy as a stage production. 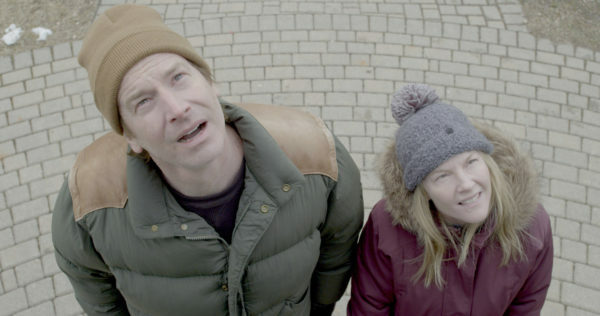 Over five years, though, director Amber McGinnis has adopted the original script to the big screen, and the scenes with the wayward couple on a frozen expanse and a playful afternoon through town are visually charming (at least to this boy from Wisconsin). Yes, the film has been a labor of love—and hard work—and that heart and muscle show through in the final product—and places the movie as a film that punches far above its weight class (or, in this matter, budget). Ultimately, International Falls delivers its punchlines as a sock to the gut—which is a good thing.